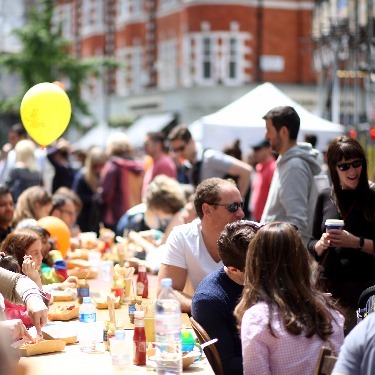 The Marylebone Summer Festival raises money and awareness for Greenhouse Sports charity. Greenhouse Sports uses inspirational sports coaching and mentoring to engage young people and improve their life chances. They partner with schools to provide opportunities for young people who may be disengaged, vulnerable or facing disadvantage to develop the social, thinking, emotional and physical skills that help them thrive. In 2019 Greenhouse Sports is providing more than 50 sports coaching programmes in schools across 16 London boroughs, and will coach nearly 8000 young people this year. They only work in schools where at least two-thirds (67%) of pupils live in areas of high deprivation, or which are specifically for young people with special educational needs. They invest in these areas because they firmly believe in their model and its ability to make a difference in the communities with which they work. They opened their flagship home, The Greenhouse Centre, on Bell Street in Marylebone last year. It is a community sport centre and a unique facility where their inspirational coaches deliver high-quality sports programmes. The Centre is home to their existing Greenhouse Sports Table Tennis Club, as well as other sports programmes for young people and their families from the local community and beyond. ​The Howard de Walden Estate is thrilled to be supporting Greenhouse Sports this year and all donations are gratefully received.